Dry ice blasting is a cleaning technique similar to sand blasting, but makes use of dry ice pellets (solid CO2) instead of abrasives. Dry ice has a temperature of -79°C and evaporates into the air at atmospheric pressure. It is called “dry ice” because it doesn’t contain water. The dry ice pellets vaporize to carbon dioxide gas on impact. Due to this expansion the contaminant is lifted and separated from the base material. In contrast to sand blasting, dry ice blasting does not create any secondary waste because dry ice sublimates on contact. This makes dry ice blasting a much more ecological technology than sand blasting! The dry ice blasting machines are also much lighter and compact than sand blasters what makes it easier to move the equipment. Another advantage contrary to sand blasting is that dry ice blasting does not damage the surface of the object to be cleaned, sand blasting does because it is highly abrasive. Why use dry ice blasting? 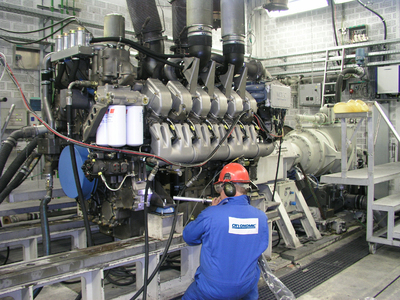 Dry ice blasting generates up-time: substantially reducing downtime by eliminating the need to strip down and reassemble machinery parts. Dry ice blasting eliminates the need for detergents or chemicals to degrease. Dry ice blasting is non-abrasive compared to sand and grit blasting or cleaning with brushes. Dry ice blasting is environmentally friendly: the removal of stubborn contaminated layers without generating waste (the dry ice simply disappears). Dry ice blasting machines are compact and versatile: the cleaning equipment can be taken to the large object to be cleaned, not the other way round. 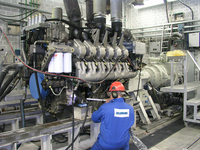 Dry ice blasting can be used anywhere where water, sand or other cleaning products are not allowed: Dry ice blasting is a suitable technique for use on electrical machines and in the food industry. Cleaning with water, chemicals or sand blasting can hardly beat the cleaning time with dry ice blasting. The main advantage of dry ice blasting is the substantially reducing downtime by eliminating the need to disassemble and reassemble machinery parts. To give you an idea of the cleaning time with dry ice blasting compared to other techniques, CRYONOMIC® made a comparative table with for example: Cleaning a printing machine. How does a dry ice blasting machine work? A dry ice blasting machine brings dry ice pellets in a flow of compressed air. The air flow and pellets are projected at supersonic speed towards the object to be cleaned. 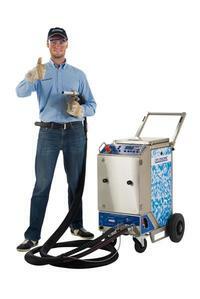 What do you need for dry ice blasting? A dry ice blasting machine (COB or COMBI series) with accessories: we will gladly look for the best machine for your application. Do you want to test in advance which machine is the most suitable for you? Do the free test on our website. Compressed air from the factory or a compressor specially equipped for dry ice blasting; more information can be found on the productpage of the compressors for dry ice blasting. All CRYONOMIC® dry ice blasters are based on CRYONOMIC® patented technology. The smallest dry ice blasting machine that CRYONOMIC® produces is the COB62. 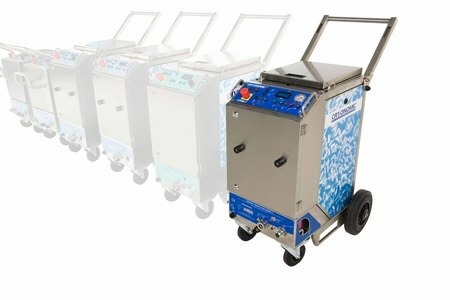 This dry ice blasting machine can be used for focalised cleaning and high performance cleaning with low air consumption. The extended version of the one-hose blaster, COB62, is the COB62plus and has the added value to clean with dry ice combined with abrasives. Dry ice blasting in industrial areas has increased sharply since many years. Being one of the first inventors in the world, CRYONOMIC® manufactures a dry ice blasting machine for industrial use, the COB71. It can apply more dry ice than the COB6-series and it can also store more dry ice in its pellet hopper. Due to the possibility of combined dry ice grit blasting it is a very powerful and versatile Dry ice blaster. This blaster can be produced with a remote control-system on the gun, this gives you the possibility to change dry ice feed rate on the gun, to change blast pressure on the gun and to change intensity of gun light. For many reasons, the market asks for a heavy duty dry ice blasting machine, which CRYONOMIC® produces for many years to allow users cleaning very intensive and long duration jobs. 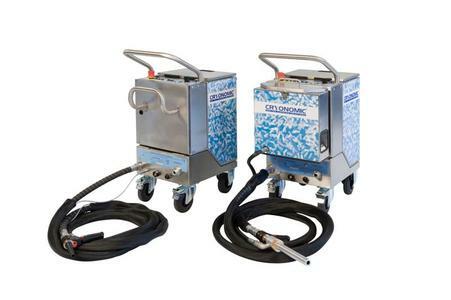 The COMBI-71(R), COMBI-72(R) and COMBI-73(R) are one- and or two-hose blasting systems which can be used for cleaning large surfaces and cleaning on longer distance. Many industries benefit daily of the advantages of dry ice blasting. This technique is used in so many industries for so many applications, that it is hardly impossible to list them all. We kindly give you below some examples, but do not hesitate to visit our application page with pictures and movies from all industries. With all its experience, CRYONOMIC® not only produces dry ice blasting machines that operates manually, but also manufactures automated dry ice blasting machines. Most of these dry ice blasting machines are specially developed and used for cleaning tire moulds, but they can also be used in other industries for different applications. The dry ice blasting machines are based on the patented CRYONOMIC® technology of ARTIMPEX NV. and meets the new EC machine directive 2006/42/EC, resulting in unequalled performances with limited air consumption. CRYONOMIC® manufactures dry ice blasting equipment and export these to many countries worldwide for almost 30 years. We have a team of 60 people in different regions who spread out the CRYONOMIC® benefits. They are trained to do demo’s, sell dry ice blasting machines and are responsible for the after sales service in the applicable area. They will be pleased to give you a demonstration! And if there is no local partner in your area, we will be pleased to welcome you in the CRYONOMIC®-family! More about our dry ice blasting machines?